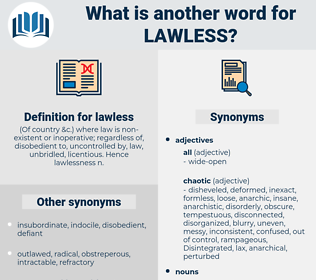 What is another word for lawless? ( Of country &c.) where law is non-existent or inoperative; regardless of, disobedient to, uncontrolled by, law, unbridled, licentious. Hence lawlessness n.
wrongful, unregulated, uncontrolled, outlawed, unscrupulous, unruly, illegitimate, chaotic. calm, legal, licit, legitimate, moderate, mild, lawful, valid, governed, rightful. docile, licensed, law-abiding, obedient, tractable, just, principled, right, Legalized, seemly, proper, amenable, supported, permitted, compliant, submissive, good, righteous, decorous, correct, suggested, virtuous, decent, orderly, controlled, encouraged, approved, ethical, endorsed. It speaks volumes, therefore, for the ascendency which these two resolute white men had set up over their wild and lawless following, that the latter should have contented itself with mere sullen obedience. It had, moreover, been whispered about that the Agrippina had guns and ammunition under the coal, which were intended for the Confederate cruiser, and also that Captain McQueen had stated that he expected to receive some further instructions as to his movements from the British consul, Mr. Lawless. lechwe, leaky, lichee, lease, lasix, logy, lassie, lass, laze, liege, lackey, luce, logic, lock away, louis, lxxx, lace, laugh away, liliaceous, leg, loquacious, like, lychee, laius, lachesis, lax, Louis Iii, leak, lycia, luck, lush, laos, lochia, lough, loss, leach, Louis Ii, loasa, liza, lao-zi, lac, lugosi, liliales, lees, lick, lessee, louse, logo, lilac, Louis Agassiz, lake, luscious, less, laugh, leechee, league, loloish, leakage, lilylike, log z's, log, leakey, legacy, leuciscus, lox, lagos, lxxii, liaise, leech, lisu, lexis, loligo, lacy, look, lysis, loasaceae, lucas, lake keuka, lock, lxxxiii, laicise, lxxxii, lxxiii, laic, lack, lose, loxia, lxxxi, logos, Lake Cayuga, leo xiii, leash, Louis Ix, lewisia, lxxi, lygus, Lego, Leo X, Louis XI, losses, Louis Xiii, lxi, lhasa, luggage, luge, loki, lasso, lxx, look away, lousy, laicize, lewis, leigh, leggy, loose, louche, laws, lucky, lash, likewise, leo ix, leacock, Louis Xii, luxe, lxii, loos, lucy, lockage, lxiii, lachaise, lassa, lag, loch, loach, lyssa, Lugh, lie awake, lascaux, Louis X, lichi, lakh, lockjaw, lollygag, Lusaka, lazio, lek, lycee, luik, lx, legs, loco, lazy, Lech, loess, locus, lossy, lac wax, leek, Liliaceae, luke, loge, Louis I, lux, lallygag, low-key, Leo Esaki, loggia, lycosa, locke, llullaillaco, lug.